I originally posted this a few years ago and so many of you have emailed me letting me know how much you and your family enjoy it that I thought I would post it again. It's delicious - hands down one of our favorite cakes. 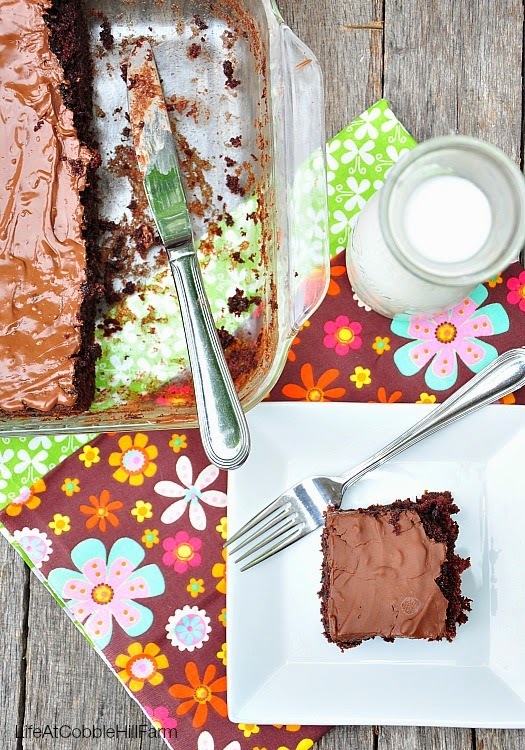 It is great with frosting or without frosting and just a light sprinkling of powdered sugar. 8 T. unsalted butter, at room temp. Preheat oven to 350 degrees and butter and flour a 13 x 9" pan. Stir together, in a med. size bowl, the flour, cocoa, baking powder, baking soda and salt. Using an electric mixer in a separate bowl, beat the butter, oil and sugar on high speed until well combined. Add eggs one at a time, beating well after each. Gradually stir in the flour mixture, then the sour cream and zucchini. Blend just until combined. Spread evenly in prepared pan. Bake until toothpick comes out clean, about 45 minutes. Cool completely on a wire rack. For the frosting: when the cake is cooled, melt the chocolate chips and oil in a microwave safe dish, in the microwave, stirring often. Spread over the cooled cake. Hi Staci! The cake looks delicious! I want to try this soon! Thanks for sharing the recipe with us! Blessings from Bama! My mouth is watering. 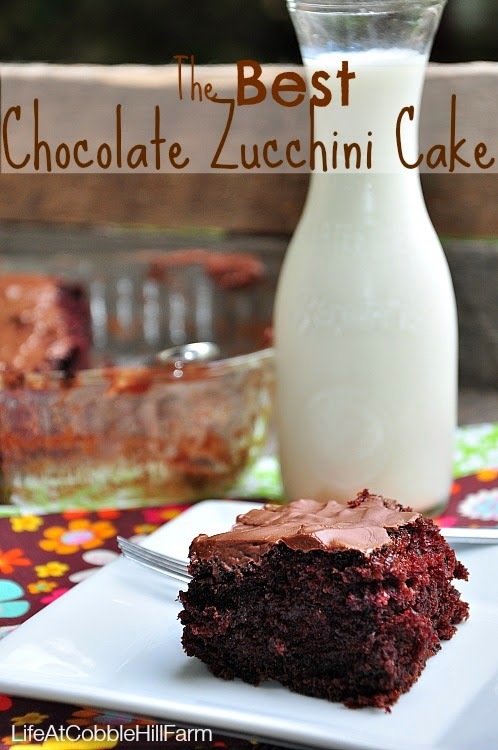 I know what a super moist cake zucchini can make! I just subscribed to your blog recently and this was the first email I received. What a great coincidence as we had a bunch of zuchinni to use up. I made this for my wife on the first day of her new job and it was a delicious hit! Thanks for posting again! Thanks so much for this great recipe. I made it as soon as I saw it on your blog on monday.The whole family loved it and no one did guess that there are zucchinis in it! 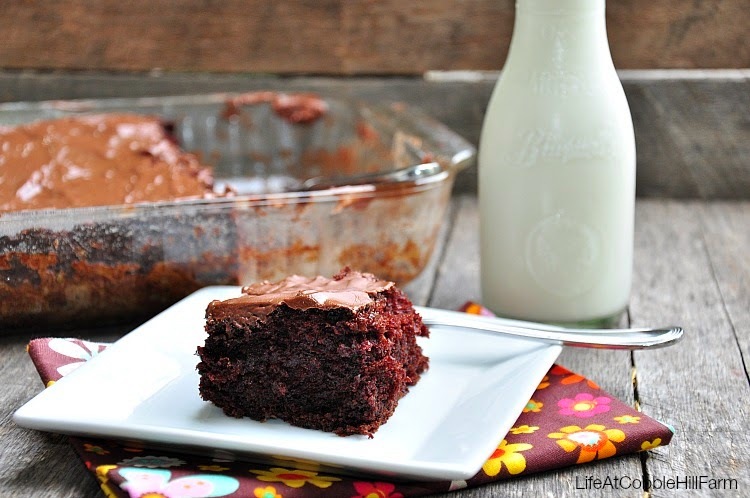 I love my recipe for chocolate zucchini cake, and plan on posting it this week. BUT, I think I will have to try your recipe! It sounds delicious!